Are you interested in adding a pergola to your property in the St. Paul, Minnesota, area? If so, turn to the experts at U.S Patio Systems and Home Remodeling. Our pergolas can transform your underutilized backyard into an outdoor living space you and your loved ones can enjoy for many years to come. Not only will a pergola provide a partially shaded space to relax in, it will also add a sophisticated look to your yard that can even result in adding value to your home. • Ease of maintenance– Our pergolas come with an electrostatic finish that results in virtually maintenance-free products. • Durability – Made of extruded aluminum, your new pergola won’t warp, crack, peel, or rot. • Customization – Choose from one of our many designs that include both attached and freestanding styles. • Maximum sun protection – The curved lattices our pergolas are manufactured with provide maximum sun protection, so you can enjoy even more shade. 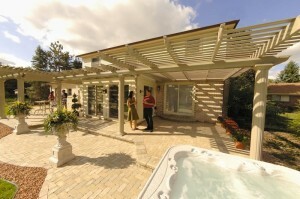 In addition to the high-quality pergolas we have available, we also offer expert installation services. Our team of skilled professionals will ensure an efficient installation so that you can begin enjoying your new shade solution right away. If you would like to find out more about the pergola selections we have available to homeowners in St. Paul, MN & surrounding communities, contact U.S. Patio Systems and Home Remodeling today. Our specialists are available to answer any questions that you have.